Our San Francisco Travel Guide covers most of San Francisco sights, tourist attractions and monuments. 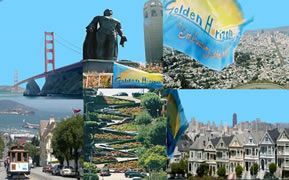 Our San Francisco Travel Guide provides complete descriptions and historical backgrounds of each monument and sight in San Francisco. This Travel Guide helps tourist and visitors to learn more about each sight off interest they are visiting. Alcatraz Island " The Rock "
Does Coit Tower looks like a fire nozzle? Who was Lillie Hitchcock Coit? Some qualify Lillie Hitchcock Coit as an eccentric and liberal modern woman while others believe she was an icon and lover of San Francisco. One day in the afternoon, a pioneer fire company had a short staff on the ropes as it raced to a fire on Telegraph Hill. The firefighters were surprised by a girl who came to give them a hand and incited others to pull up these heavy ropes and help the short staff of firemen to carry out their mission on Telegraph Hill. Lillie Hitchcock Coit became famous figure thereafter and embedded the spirit of Volunteers in San Francisco. Lillie Hitchcock Coit real name is Elizabeth Wyche Hitchcock who married Mr Coit and that’s how she got the name Coit! She was fascinated by the firemen and their careenage in carrying out difficult mission in San Francisco. Lillie Hitchcock Coit became a famous local and international figure thanks to her initiative and creative personality. After her death in 1929, her will was executed when Coit Tower was finally built in her honor and this of San Francisco firemen. She basically sponsored Coit Tower project with her own money but never saw or new about this future legendary tower. Coit Tower is a 180-foot cylindrical tower which stands atop Telegraph Hill . It offers spectacular views over San Francisco Bay. The Tower became a symbol and Icon of the city of San Francisco thanks to Lillie Hitchcock Coit Generosity. The Pacific Heights or " the Beverly Hills of the North "
The Pacific Heights is the elegant fancy district located between the presidio from the west, Cow Hollow and Marina District from the north , Japan Town from the south and Van Ness limits The Pacific Heights from the east. The Pacific Heights is a scenic neighborhood offering panoramic and spectacular views of San Francisco Bay, the Golden Gate Bridge, Palace of Fine Arts , Alcatraz and the Presidio. The Pacific Heights is home to an interesting class of San Francisco denizens, from yuppies to the elite. The Pacific Heights is considered is one of the most elegant and expensive real estate area in the US. Is the The Pacific Heights home to movie stars, celebrities and wealthy people? Find out now? The Golden Gate Bridge- " The Icon of the West "
San Francisco's Japanese Tea Garden stands in the middle of the Golden Gate Park. 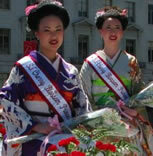 The Japanese Tea Garden is surrounded by interesting museums and by San Francisco botanical garden. San Francisco's Japanese Tea Garden was created by the famous Japanese Baron Makoto Hagiwara. San Francisco's Japanese Tea Garden was offered as a gift to the city of San Francisco, the Japanese Tea Garden was inspired by the 1894 World's Fair exhibit called The Japanese Village. Learn more about this unique symmetrical Japanese garden..
Alamo Square - " The painted Ladies "
Union Square - " The vibrant Heart if San Francisco "
The Palace of Fine Arts " Pure Classic Architecture "
San Francisco's North Beach district is the area located in north-eastern part of the city of San Francisco. San Francisco's North Beach is a bustling part of the city with vibrant flavor and a lively, fun ambience. Known primarily for its Italian roots and its Mediterranean atmosphere, North Beach is a beautiful vibrant part of San Francisco for day and night life. Chinatown- "The City within the City"
Golden Gate Park is the largest park in San Francisco City and County. The Golden Gate Park is actually longer than the Central Park in New York. However, the Golden Gate Park is not as wide as Central Park in New York. The Golden Gate Park is a 1017 acres park that extends from the Pacific Ocean in the west to Stanyan Street in the East, located 20 blocks from San Francisco Civic Center. The Golden Gate Park is limited by Fulton street (North) and Lincoln Way(South). The Golden Gate Park attractions are number one in San Francisco for nature lovers and outdoors people.